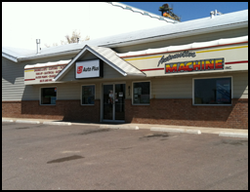 Located on 25th Street North in Great Falls, MT, Automotive Machine Inc.’s Parts Store carries an extensive line of automotive parts and products for cars, trucks and SUVs. Our product line covers both foreign and domestic vehicles as well as parts for high performance vehicles. Our inventory of in-stock engines is always fully guaranteed, and if we don't have the engine you need in stock - we can simply build it for you. We promise only the best of quality in every auto part we sell. And if you`re not in the Montana area, no problem. We ship anywhere! For your convenience, we are open from 8:00 AM to 5:30 PM, Monday to Friday. ​If you need help locating a particular auto part for your foreign, domestic or high performance vehicle, please contact us today.